In business, certain ways of conducting commerce are so unique that they literally transform their category, and sometimes, the industry. In recent years, certain technologies have so permeated our culture that we refer to them as "disruptive technologies," because they change not only an industry, but our society at-large. The Church has experienced some disruptive technologies, as well. Centuries ago the printing press and the translation of the Bible into the languages of the people radically changed the Church. More recently, the church has wrestled with "video preaching"—a technology which drew early criticism but is proving very effective in teaching people about God and the Bible. In fact, most of us at Access are so used to it that we sometimes forget to tell our guests that Andy Stanley, our teaching pastor, joins us via video. The reality is that our culture is changing more rapidly than ever. 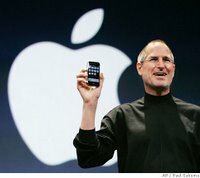 Just search YouTube for SNL and MadTV parodies of Steve Jobs' near-constant upgrades to the iPod. It seems as soon as you get something cool, something cooler comes along. The Church will continue to change and speak into culture—still with God's voice (that must never change)—but in a new language for each generation. Because, there has never been any event quite so disruptive as the Creator of the World being born in a stable, living a perfect life, and being crucified on a cross. The religious leaders never saw it coming, and they never imagined the tomb would be empty in three days! Perhaps Tuesday's announcement will give the Church one more tool to speak God's truth in a way that our culture can understand. Because His story is worth telling—however we do it! Okay, it looks like I'm going to have to go first with the predictions. Here we go...MacWorld 2008...Apple Inc. introduces...Smell-o-vision! Inspired by the banners just spotted through the windows of the Moscone Center that say, "2008: There's something in the air." Okay folks, so it's an amazing-looking MacBook, and a much-improved AppleTV. Any thoughts?